Congratulations to the Boys Volleyball Team – LL League Champs! 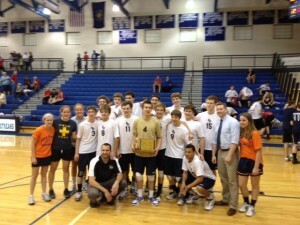 Congratulations to the Penn Manor Boys Volleyball Team for winning the 2012 Lancaster-Lebanon League Championship! The Comets defeated Hempfield 3-1 to capture the crown on Wednesday, May 16. The team starts district play on Wednesday, May 23 at 4:30 p.m. at Central York in a round-robin tournament.